Want to know where to eat in a new city ... ask your new friends. Want to know the mood and pace of a city, read its newspaper. But what do you do if you want to know where the top neighborhoods are? How can you tell where you might want to live, apart from the average home values and their zoning for schools? One way could be to see where everybody has been moving recently. You could figure that if you go where everyone else has been going, then you likely will be able to sell your home if you need to move away. Just a thought. 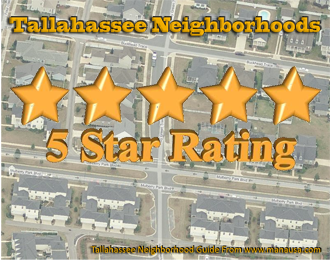 One of the hottest pages on the Tallahassee Real Estate Website is our Tallahassee Neighborhoods Page, which contains links to thousands of neighborhoods in Tallahassee. Additionally, it contains links to the MLS listing of homes for sale in those Tallahassee neighborhoods, so it serves as a great reference for the communities in and around Tallahassee. Today, we'll break down recent home sales in Tallahassee by area and by neighborhoods so you can get a feel for where people are moving in Tallahassee. 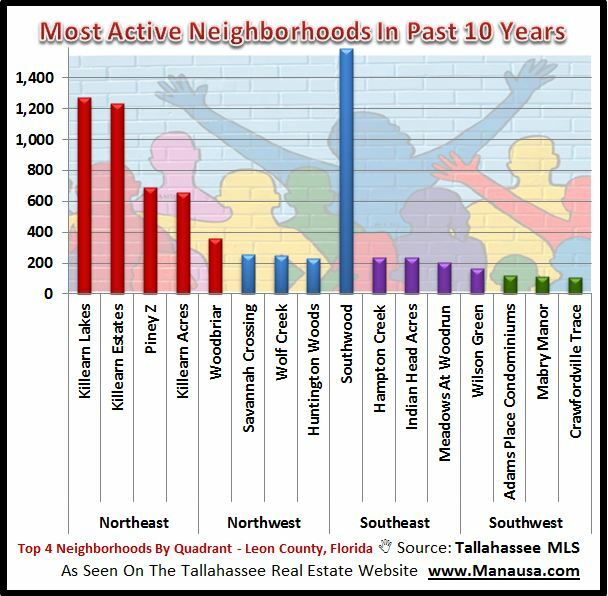 Not surprisingly, 6 of the top 7 most active neighborhoods in Tallahassee in 2011 were in the Northeast, and all of them were on the east side of town. Southwood has been the most active neighborhood, but the Killearn Communities north of I-10 collectively have the overwhelming mass of home sales in Tallahassee. When we look at the real estate graph above, all but Piney Z appear to have put their slowest selling years behind them. This next graph shows the top 4 selling subdivisions in Tallahassee by area. 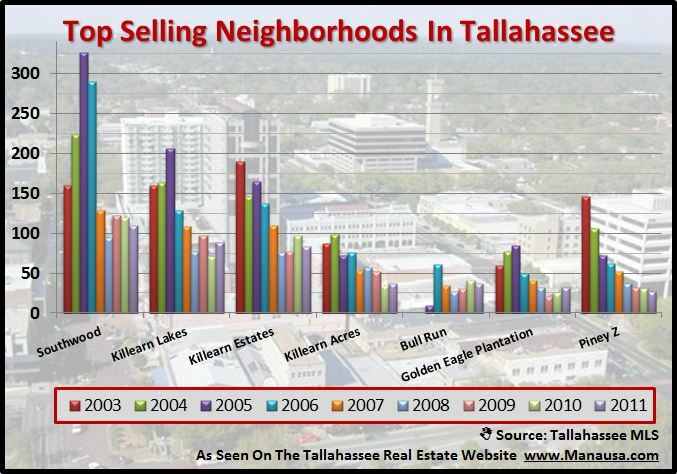 This graph provides some perspective on how the volume of home sales in Tallahassee is spread around. More than one half of all home sales are in the Northeast, and roughly two thirds are on the east side of town. Based upon the current list of homes for sale in Tallahassee, this trend will continue for many more years. Of course, if you really want to know where to live in Tallahassee, just drop me a note and we can schedule a time to compare your needs and wants with what different Tallahassee neighborhoods have to offer. You don't really need to keep up with the Joneses, there is a right neighborhood and home for you and your family.